Custom Maid 3D 2 is a comprehensive game in its own right as you manage a club and its staff. The game has come along leaps and bounds since this was posted. Now the game has lots of DLC, you can find every kinds of women here. 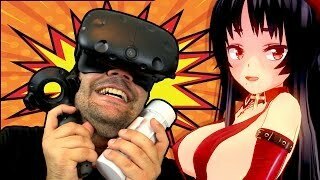 And most importantly the game has motion control support not only using Oculus Touch, but also a creative controller called Chub-lips. Although we don’t understand Japanese, just look at the shape and we can imagine how to use it.